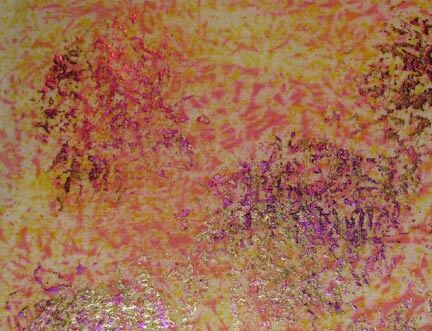 In March, I shared with you a book review of Shelly Stokes's new book, Rubbing Plate Roundup, and I showed you some fabric that I stamped and foiled using her methods. Well, I saw the fabric sitting on my work table next to some other fabrics, and the next thing you know, I was cutting out a small geometric quilt. 1. Cut the felt pieces to the same size. The black felt pieces will end up a bit bigger than the colored fabrics. 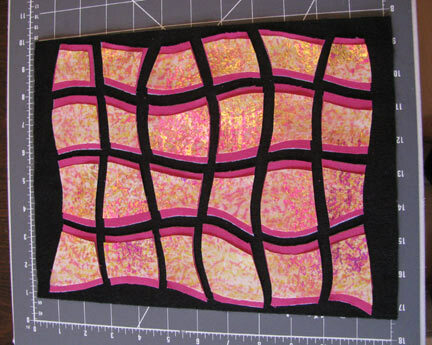 Cut the pink fabric slightly smaller than the black, and the multi-colored slightly smaller than the pink. 2. 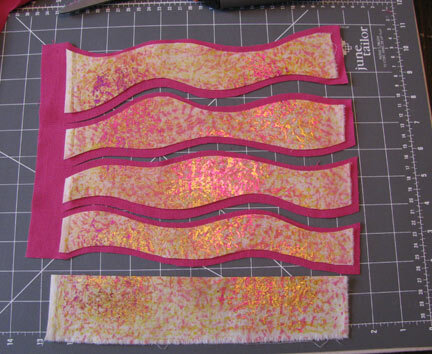 Stack the pink and the multi-colored fabrics and cut a wavy edge along one of the longer edges. 3. 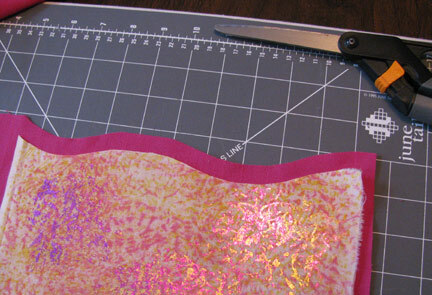 Pull the multi-colored fabric back from the edge, twice as far as the border that you want, keeping it even. 4. Cut the next wavy strip. 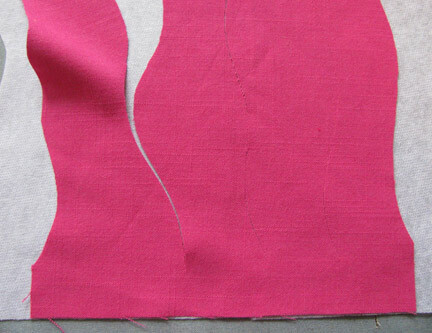 Do not cut all the way through the top of the pink fabric, but leave it slightly attached. 5. Pull the multi-colored fabric back slightly from the edge again. 6. 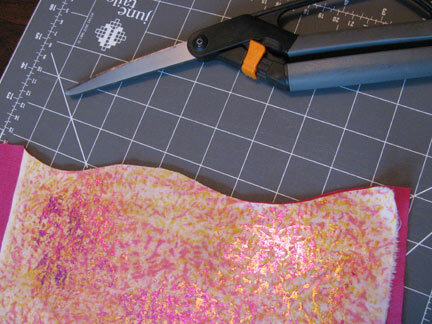 Continue to cut and readjust the top fabric across the width of the two pieces. Cut the other long edge wavy to finish. 7. Remove the multi-colored pieces, keeping them in order. 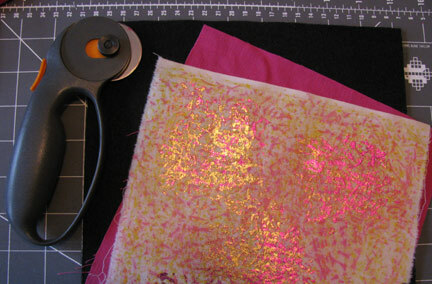 Iron fusible interfacing to the back of the pink fabric before cutting off the part of the pink fabric that is still attached. 8. 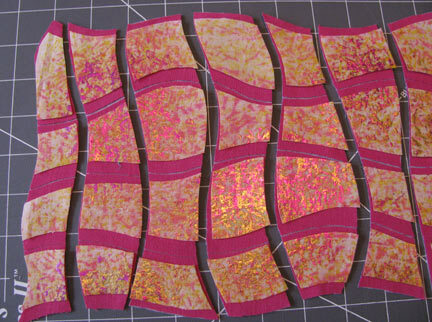 Place the multi-colored strips back onto the pink fabric and cut the top and bottom edges in a wavy design. 9. 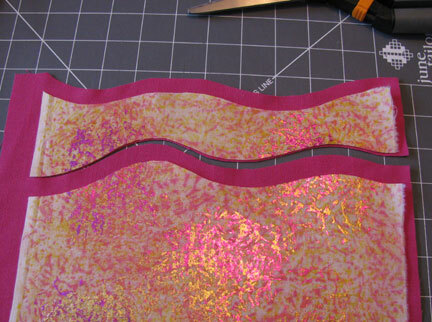 Continue cutting strips crosswise in a wavy pattern. 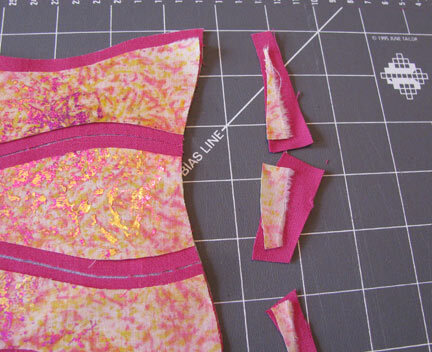 If the multi-colored fabric wants to shift as you cut, anchor it in place with small pieces of double-stick tape. 10. 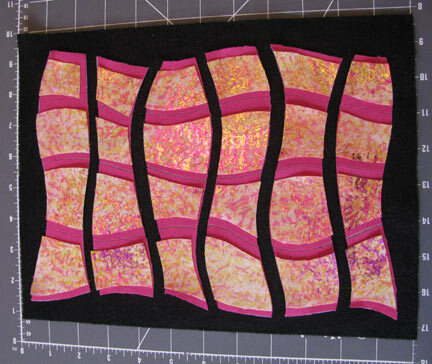 Place the strips carefully on top of a piece of black felt. Pull the strips apart from each other so that the black shows through between rows. 11. 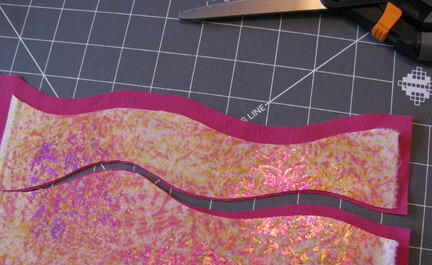 Carefully cut the lengthwise strips apart, following the previously made cut marks. Pull the strips apart from each other as in step 10. 12. 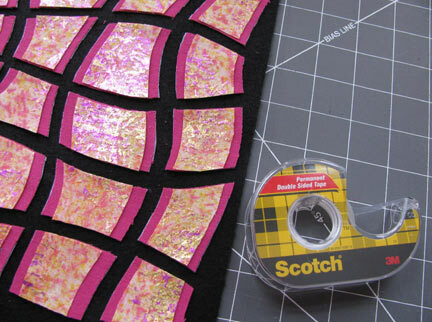 Use small pieces of double-stick tape to anchor each fabric stack. 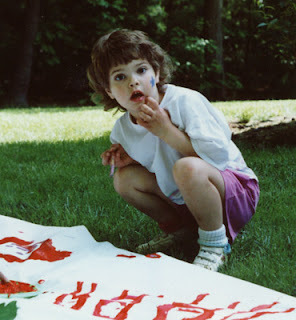 Next week - embroidering and finishing the quilt. This looks wonderful! Great colours, too. This is way too cool, Cyndi!!! I have to bookmark and try later this spring/summer/lifetime!!! Thanks for sharing...look forward to the finishing you do on this! Boy, the black background really makes those colors pop. Gorgeous!